Be the first to share your favorite memory, photo or story of Judge. This memorial page is dedicated for family, friends and future generations to celebrate the life of their loved one. 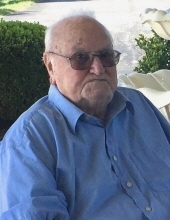 Mr. Judge Garnett Rodgers, Jr. of Campbellsville, Kentucky, son of the late Judge Garnett Rodgers, Sr. and Essie Shuffett Rodgers, was born on Saturday, October 17, 1925 in Adair County and departed this life on Monday, March 18, 2019 at the Grandview Nursing Facility. He was 93 years, five months, and one day of age. He had made a profession of faith in Christ and was a member of the St. Mark United Methodist Church. He was also a former Tool Clerk for Parker-Kalon Manufacturing. He was preceded in death by his wife: Doris L. Rattliff Rodgers on January 14, 2017, having united in marriage on April 6, 1957. Survivors include a daughter: Jennifer Rodgers of Campbellsville; two sons and daughters-in-law: Mark and Lisa Rodgers of Campbellsville, and Randy and Jane Rodgers of London, Kentucky; four grandchildren: Marcus Rodgers and his wife, Mary Kate, Kayla Rodgers all of Campbellsville, Aaron Rodgers, James Rodgers both of London; a sister: Sara Murray of Greensburg; and a host of other relatives and friends. The funeral services for Mr. Judge Garnett Rodgers, Jr. will be conducted at 12:00 Noon, Eastern Time, Saturday, March 23, 2019 at the St. Mark United Methodist Church in Campbellsville with burial to follow in the Campbellsville Memorial Gardens. Bro. Tony Franklin officiating. Cowherd and Parrott Funeral Home in Greensburg in charge of the funeral arrangements. Visitation is requested after 10:00 A.M., Eastern Time, Saturday at the church until time of the funeral service. Memorials are suggested to the St. Mark United Methodist Church General Fund or the Methodist Children's Home, which can be made at the funeral home or the church. To plant a tree in memory of Judge Garnett Rodgers, please visit our Tribute Store. "Email Address" would like to share the life celebration of Judge Garnett Rodgers. Click on the "link" to go to share a favorite memory or leave a condolence message for the family.